This past November we picked up a 2011 Orange Madness Switchback Assault from Rexburg (Idaho) Motor Sport and ever since have pushed it in and out of its comfort zone; which hasn’t caused it to shiver or shake in its boots. The “Spring-buy only” sled is beyond a typical crossover. 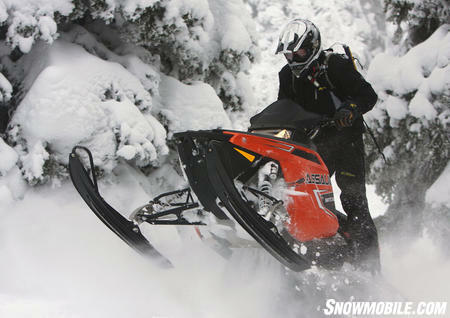 With its Series 4.0 144-inch RMK powder track with two-inch lugs, the 800cc Cleanfire-powered Orange Madness Assault launches hard out of its hole when kicking the trails and will lift itself atop the powder to display RMK-like deep-snow capabilities. This Polaris is a jumper as Klim’s marketing manager John Summers discovers as he launches the Mad Orange Assault, leaving snowflakes wondering what just trounced them. This crossover sled is a sure-footed Rush-like sprinter with cross-country drive. Simply, from our early experience, the Pro Ride Assault is a light and nimble mountain knocker and, by default, a highly capable crossover. As we racked up “break-in miles” prior to our annual powder evaluations, we offer our initial impressions. On trail, it is nailed down, tracking like a slot car, holding steady through the swells and whoops. 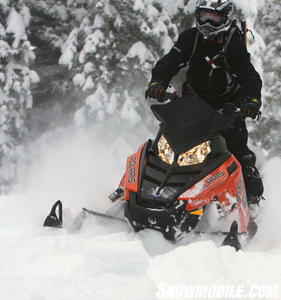 Its shock package is more forgiving than its brother, the RMK Pro, giving a falling rate feel. We thought the taller lugged powder track would push the front end through the corners and bends on a groomed trail, but with smart throttle and brake tethering, and body positioning, the Assault draws tight lines. However, we’ve noticed when a trail is covered with loose powdery snow the two-inch lugs began pushing the nose through the bends, as expected. When this occurred, we would momentarily chop the throttle closed and give its Rush skis time to bite, thus allowing the Assault to gather itself up. Mostly designed as a meadow buster and trail tamer, the Orange Madness Assault fitted a two-inch paddle track was at home in Island Park working the same slopes as its powder-specific RMK Pro brother. Speeding over two- and three-foot high moguls, feedback through the bars and seat was high — the Assault’s front suspension and rear skid was stiffly set from the factory (though softer than the RMK Pro). We turned down the Walker Evans shocks to a softer setting, which eliminated most negative feedback. In the mountains, the mad orange Assault spun its 144-inch track at such high speeds that, so far, it has climbed most mountains our mountain-specific snowmobiles have ascended. At times though, drivers have had to cut right or left turns to keep it lumbering up mountain, but all in all, it has made the ascents. 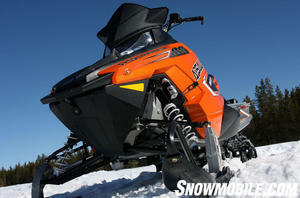 Yes, our test Assault resides in the Rockies, and no, we didn’t fully expect it to equally battle with the 800 class mountain sleds, like the RMK, Ski-Doo Summit and Arctic Cat M. What we have experienced so far, shows this sled has a hunger to do so. For example, the first weekend after the New Year, while snorkeling through deep Island Park, ID powder, our fleet of test riders, who watched the Switchback Assault work the mountains, did not know the Assault was an “Assault” with a 144-inch track, until we told them. Then the common comment was: “What? I thought it was an orange RMK Assault.” They were fooled. We found that the Assault’s wide runningboards, wider than those on the RMK, hung up the chassis at times in ultra deep snow. But they were appreciated when standing up while moto-crossing on the trails. The Rush-inspired front end, so far, is as adept in the mountains as it is on the trails. Because the Assault is agile, we are learning its lower-than-RMK Pro-Taper handlebars, less the center mountain strap, is not a negative when working deep snow. Foot placement and body position guide the Assault. It is quick to respond to every driver command. The Assault is all about being dual purpose as the motor, suspension and narrow profile contribute to its dual role effectiveness. The Assault differs from our RMK Pro test unit in that it has Rush IFS steering, 42.5-inch ski stance, Rush skis, wide trail-sized running boards, Pro-Taper handlebars less a center strap, torsion spring rear suspension, and three-degree tipped-up rails. 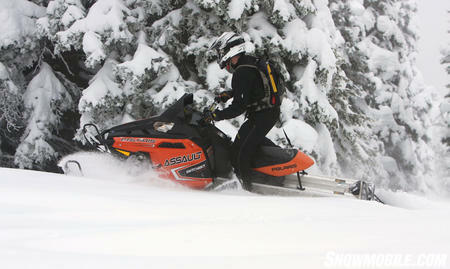 So far the Switchback Assault has proven to be a best-of-both-worlds snowmobile. It inspires confidence on the trails and thanks to its 144-inch rear suspension, it is comfortable as well. It is not an RMK killer when taken off trail, but it wasn’t meant to be. Its purpose is “dual-purpose” and our early impressions indicate it is gainfully employed in that role. We will report more on the Orange Madness Assault as the season stretches out. We will keep it in its design envelope, testing its capabilities. To date we’ve learned this sled fills the bucket for the combo trail and mountain rider. It has the makings to satisfy the vacationer from flatland North America who trailers to the Rockies to burn the Western trails and mountains. If you are a flatlander who has one of these sleds and are planning on riding the Rockies, then you should have no reservations in sticking it into its dual-purpose world. However, if planning on deep powder riding, we recommend one change — swapping out the 1.352-inch Cobra paddle track for the Series 4.0 RMK paddle track. You will not be disappointed.